Asst. Professor and DML Director Kimon Keramidas led us in another DML Salon afternoon on Tuesday afternoon. The session featured digital projects from classes, exhibition interactives, faculty projects and other student digital work. Curator Ann Tartsinis walked us through the dynamic interactive about to be installed for her Focus Gallery exhibition, An American Style. 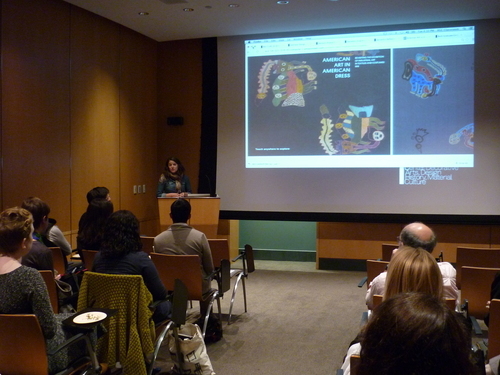 Professor Catherine Whalen demonstrated the new Digital Archive of Craft, Art and Design that she and her students have been compiling, and which launches in a week, and three students in the past spring’s Hoentschel class of Deborah Krohn and Ulrich Leben — Hannah Kinney, Antonio Sanchez Gomez, and Kelsey Brow, each showed us the virtual exhibitions they prepared for the course. Rounding up the salon, Danielle Charlap and Zahava Friedman-Stadler spoke about their projects for the Interface Design class. These sessions, once a semester, give the whole community a chance to review some of the really interesting work coming out of our Digital Lab, filtering into our classrooms and exhibits.